Since the advent of aviation, there has been a challenge to produce a safe, economical and reliable aircraft at a price the average person could afford. To mass produce such an airplane and still show a profit to the manufacturer has always been quite difficult. One of the most successful men to attack this problem with success was Edward Bayard Heath. Ed Heath was born in 1888 in Brooklyn, New York. While quite young, his family moved to Amsterdam, New York. His formal education was diminutive, but through self-determination he gained a respected education in the use of various materials and there application in construction and engineering. Through trial and error he built a successful airplane, patterned after a Bleriot monoplane, in the family's machine shop and flew it from a hillside of the Antlers Club at Amsterdam in 1909 and 1910. During one of those flights, he could not clear a fence at the end of the field. The resulting damage would take considerable expenditure of time and money to repair. 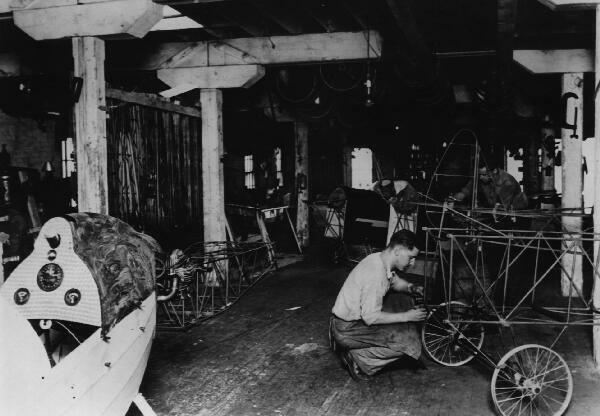 Heath went to work for Curtiss at Hammondsport, New York, but was disheartened to find the only position open was in the motorcycle department. He wanted to work in the airplane division but found consolation in being able to study the various Curtiss flying machines. This helped Heath considerably from the standpoint of theory, design and construction of a successful "aeroplane" and give him the opportunity to gain a thorough knowledge of motorcycle engines - - two ingredients he would later combine into his own designs. Heath received a telegram from his uncle stating that a contract was at hand if he would appear at Gloversville, New York, with his "aeroplane" during the fair. He quit Curtiss and returned to put the original Heath monoplane back into shape. His flights were quite successful and without incident. Far more aviation activity was taking place in Chicago than Heath could find around the Amsterdam area so in 1913 he moved to the Windy City to establish the E.B. Heath Aerial Vehicle Co. From a small shop he sold wire, cables, fittings, radiators, wheels and other items. His specialties were steel sockets and turnbuckles which sold for 9 cents and 5 cents. He even had a catalog which was sent for "six Red Stamps" (six 1 cent postage stamps). Heath had set up one of the first aviation parts stores. A wiry little man of five feet, 110 pounds, Ed Heath abounded in enthusiasm. He had a natural knack with mechanics, was expert at carving propellers, and did everything he could to please his customers. In 1913 he built his second airplane, a float equipped biplane of 33 foot span. 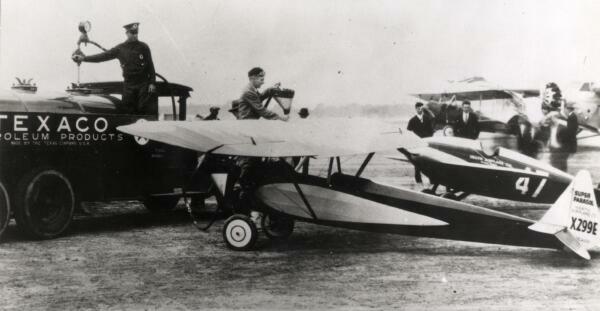 It flew well but was underpowered, having only a 35 hp 2-cylinder engine. Business flourished during World War I. Aviation was growing and so was the competition. Prices during the war skyrocketed and it appeared that the average man was not going to be able to fly if the trend continued. What was needed was a flying machine cheap enough for the man-in-the-street to buy and just as easy to fly. To Heath everything in aviation was too expensive. He set about to prove this in 1918 by building his third airplane. For all practical purposes this was his first light plane. 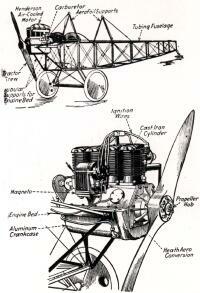 He came up with a 270 pound single seat biplane with a 20 foot wing span, powered with a 12 to 15 hp motorcycle engine. He had taken the engine, modified, lightened and worked over it until he was satisfied it would be suitable for an airplane. Heath had no trouble flying his new airplane which he called the "Feather." He planned to build and sell his new design, but WWI came to an end and the government began unloading so many surplus aircraft and engines on the market that even the "Feather's" anticipated low price could not compete. Heath began to specialize in replacement equipment for Standards, Thomas Moreses and Jennys. Business picked up and barnstormers all over the country knew where spare parts could be had. 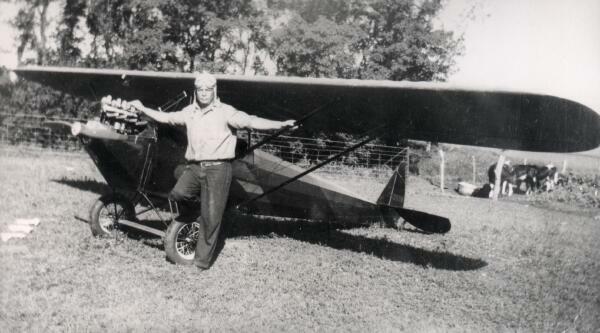 Heath bought several trainer type airplanes himself and taught flying. During the war he had changed the business name to Heath Airplane Company. 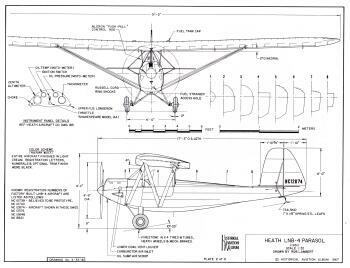 However, it was not until 1921 that Heath got around to designing another airplane. In the fall of 1922 the "Favorite" biplane was completed. He flew it from Chicago to St. Louis with four passengers, winning 3rd place in the "On to St. Louis Air Race." 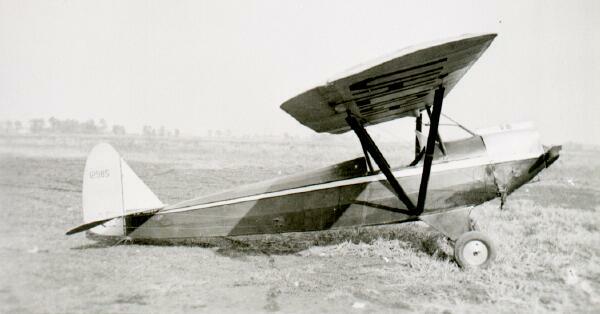 The success of the "Favorite" prompted Heath to enter the aircraft manufacturing field permanently. He hired aeronautical engineer Claire Linstead and together they produced the shoulder wing, full cantilever monoplane racer known as the "Tomboy." Wingspan was 22 feet and power was supplied by the small 32 hp Bristol Cherub engine. Heath piloted the "Tomboy" to first place at the National Air Races held at Philadelphia. He defeated a field of seven aircraft and won $2,250. With this prize money Heath and Linstead set about designing the first of the famed Parasol models. Ed Heath fueling his Super Parasol at the 1929 National Air Races. It appeared to Heath that he now had the formula for a suitable "averageman" lightplane. Another, more refined version of the Parasol was constructed in the spring of 1927. He flew it to Spokane National Air Races and won $1,500 in the light plane efficiency class. He was gaining national aviation attention and recognition came from all parts of the country. Heath began to preach "Build your own airplane." Some customers wanted the whole machine. Some wanted only parts. The Heath Super Parasol was created and advertised for $595.00 complete fly-away factory. After a disastrous fire in 1928 he moved and increased expenses forced him to increase the price to $695.00. Heath also sold blueprints for $5.00 to people wanting to build their own. The Heath engine, a four cylinder inline upright air cooled type, basically a converted Henderson motorcycle engine, was the recommended engine to use. In later years the Heath engine was further modified and given the company designation B-4. The engine, including a wood propeller, sold for $285.00. Between 1927 and 1930 hundreds of blueprints and dozens of kits were sold, but only a few factory-built models were completed. With the success of the Parasols, Ed Heath's dream had come true. He had successfully marketed a low-cost airplane. There's more to tell about the Depression years and later, but that is another story which will be completed in a future eColumn. 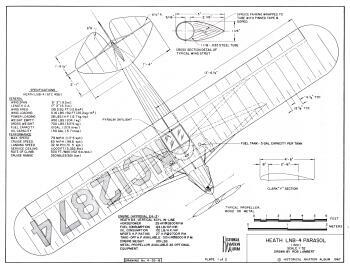 Aviation Heritage is a publisher of Aviation Books, Airplane Photo CDs & Airplane 3-view Scale Drawings. © The Aviation History On-Line Museum 2000 All rights reserved.